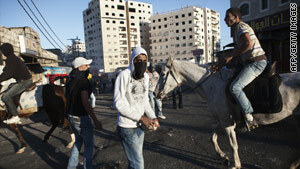 Palestinian youths gather Saturday in East Jerusalem, where clashes with the Israeli military have plagued the streets. Jerusalem (CNN) -- Israeli forces killed two young Palestinians on Sunday, bringing to four the number of Palestinian youths killed in clashes with Israeli forces this weekend. Israeli and Palestinian sources disagreed about the circumstances of the fatal shootings on Sunday. Israeli military officials said troops fatally shot the two after they tried to stab an Israel Defense Forces soldier who was on routine patrol southeast of Nablus, military officials said. But Palestinian sources said the two were innocent farm workers. The head of the Palestinian medical relief services for the district of Nablus, Dr. Ghassan Hamadan, said the two Palestinians were both shot in the back. One had four gunshot wounds in the back and one in the shoulder, he said. The two victims were aged 18 and 20, according to Palestinian medical sources. Red Crescent officials had earlier estimated they were between the ages of 14 and 16. Palestinian lawmaker Mustafa Barghouti accused Israeli Prime Minister Benjamin Netanyahu of trying to sabotage "any possibility for peace." Netanyahu "wants to kill any hope for peace... He is an enemy of all people, including Palestinians and Israelis, and he is behaving like a prime minister of settlers, of land thieves, not a prime minister of a government." Palestinian Prime Minster Salam Fayyad "strongly condemned" what he called "the Israeli military escalation." In the earlier incident, Ousayab Qadous, 19, was shot in the head Saturday during a rally in the West Bank, officials said. He was one of two teens fatally shot by Israeli forces. A 16-year-old Palestinian boy died earlier Saturday. The Palestinian Centre for Human Rights accused the soldiers of intentionally firing at the two "from close range," killing them "in cold blood." Israeli forces admitted there was a riot Saturday, but denied shooting at the crowd in Iraq-Burin, southwest of Nablus. Rejecting Palestinian reports, a spokesman for the Israel Defense Forces said there was no live fire, only rubber bullets. "IDF soldiers arrived at the scene in order to prevent a further clash, and were attacked by dozens of Palestinians who violently hurled rocks as a force," the spokesman said. "Soldiers responded with riot-dispersal means, which include the use of rubber bullets, in accordance with procedures, and identified hitting two Palestinians. One was evacuated by the Red Crescent and one evacuated himself from the area." A Palestinian activist group said Qadous was shot after a crowd of Palestinians protested limitations to their land access beneath the Jewish-only settlement of Har Brakha. The Popular Struggle Coordination Committee, which said it had activists at the scene, described Israelis firing tear gas and rubber bullets at the demonstrators as they returned to their village -- sparking clashes. At one point, shots were fired at a small group of young men, some of whom were throwing stones, the activists said. But the Palestinian Centre for Human Rights said the two victims were shot hours after the rioting calmed down, as they got off a minibus. The group called the shootings a war crime. --CNN's Paula Hancocks and Kareem Khadder contributed to this report.